Volunteers are clearing snow and delivering meals to the elderly in County Durham to help those most vulnerable in the cold weather. They are currently visiting Consett after a similar initiative carried out in Stanley last week. 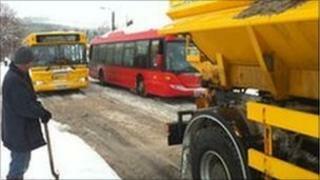 It comes as the county council urges residents to be patient as the freezing conditions continue. They say they are doing all they can to remove snow from roads and paths. Durham County Council, Durham police, the probation service and Consett YMCA have joined together to hand out meals and other produce, donated by local shops and supermarkets. Volunteers from the partnership will also be clearing snow from doorsteps and paths, as well as carrying out welfare checks and offering crime prevention advice. The council said a slight rise in temperatures meant there could be a slow melt in some areas, but the sub-zero temperatures would continue in many places. It said it had an extra 500 staff on snow clearance duties and had operated 24-hour patrols on 45% of the highways for two weeks. Head of technical services, Steve Keetley, said: "Our in-house fleet, combined with machinery held by the farmers we hold contracts with in rural areas, means we have more than 130 vehicles hard at work. "We must prioritise but I want to assure residents we are working with partners to do everything possible and that we are dealing with the thousands of requests for help as quickly as we can."